A traditional longhouse is built of axe-hewn timber, tied with creeper fiber, roofed with leaf thatch. It is nearly always built by the bank of a navigable river and the visitor approach it from the boat jetty. 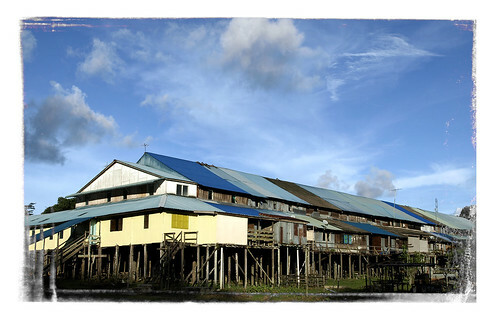 Penom longhouse is not a traditional longhouse. However it maintains the main characteristics of the traditional longhouse. Bilik is a family living room. It's a place for sleeping, for a variety of other domestic tasks, and for storing family heirlooms. It is separated from other bilik and from the ruai (further discussed below) by walls, usually of wooden planks. Sometimes there are openings in the side walls, so providing inter-communication between adjacent appartments. The ruai and panggau is about the same size as the bilik, the difference being that the later is open on all sides, thus giving access to all parts of the longhouse. Consequently it is used by members of the community as a kind of public thoroughfare. Above each family room and jutting half-way above the gallery is the sadau. In the olden days, here, in tibang (huge bins) a padi (paddy) is stored. The sadau is also to store family possessions like mats, cane baskets of all sorts and other implements for domestic use. The tempuan is the walking space of about three to four feets wide immediately adjacent to the wall which separates the bilik from the ruai. v. Dapur (kitchen and dining room). The dapur is the place for cookimg and dining. It is the combination of a kitchen and a dining room. The tanju is an open platform of about 10 meters wide adjacent to the panggau and joined to all sections within the longhouse to form an unbroken raised platform. Because it is uncovered, hardwood is used to withstand the weather. The tanju is the main venue on which the padi, immediately after harvest, is winnowed and sunned before being stored in the barkbins (tibang) in the garret. Site created by Masch.Net Technology © 2006. For all enquiries regarding this website, please contact the Webmaster.